Faced with severe rice shortage and acute water scarcity, Kerala Assembly on July 24 passed a legislation prohibiting indiscriminate reclamation of paddy fields. The Kerala Conservation of Paddy Land and Wetland Bill, 2007, received the governor's assent in early August and is now being printed for notification. Though rice is the staple food of the state, the area under rice cultivation has been dwindling for the last three decades. The recent spurt in real estate business has accelerated the trend. According to the State Planning Board, the state lost over 5,00,000 hectares (ha) of land under paddy cultivation between 1980 and 2007; the harvest almost halved to 630,000 tonnes during the period. Large-scale filling up of paddy fields has badly affected the state's food security, groundwater availability and ecological sustainability. Kerala has always been food deficient since its formation in 1956. 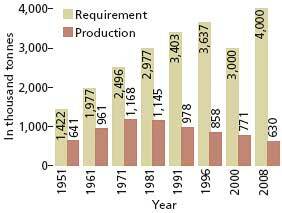 The gap between the requirement and production of rice has been showing an increasing trend in the past decades (see graph Sliding food line). The deficit which was about 50 per cent in the 1960s, increased to more than 75 per cent in the 1990s and to an alarming level of 85 per cent in 2007-2008. At present, the state produces only one-sixth of its total food grain requirement. For the rest, it depends on the Centre and neighbouring states like Tamil Nadu and Andhra Pradesh. "Decreasing rice production, collapse of the public distribution system, frequent cuts in ration allotments and rising prices of rice in open markets have badly affected Kerala's food security," says S Usha, a food and agriculture expert working with Thanal, a Thiruvananthapuram-based ngo. The hue and cry over the acute food crisis and people's struggles against large-scale filling up of paddy fields gaining momentum pushed the government to come up with the legislation, despite stiff resistance from the real estate lobby. "The situation is grave...the legislation aims to save the remaining paddy fields," says State Revenue Minister K P Rajendran who piloted the legislation. "The Assembly select committee conducted public hearings in all 14 districts of the state. Over 16, 000 people participated in the public hearings," says the minister. Among other provisions, the bill slaps a fine of Rs 50,000 to Rs one lakh and up to three years of imprisonment for those found guilty of converting or filling up paddy fields. Agriculture officers will be made responsible to ensure that paddy fields do not remain fallow or are reclaimed. In case of violations, they are to report to the revenue divisional officer. If the government officials fail in their duty, they will get the same punishment as that of the violators. Further, if farmers leave their land fallow, the authorities can hand it over to others for paddy cultivation on lease. Also, there will be a local level monitoring committee that includes village panchayats and farmers' representatives among others to ensure effective implementation of the Act. While paddy farmers in the state appreciate the legislation, many feel that before making paddy cultivation mandatory, the government should have addressed the questions of why farmers leave their fields fallow or why they switch over to non-paddy crops. There are about 300,000 paddy cultivators in the state and most of them are marginal farmers with the average holding of 0.33 ha--one-fifth of the national average. While the production cost of paddy in the state is one of the highest in the country, at around Rs 25,000 a ha, its support price has not changed much from Rs 5. 34 a kg in 1995 to Rs 10 a kg in 2007. "As for the incentives and subsidies, there has been quite an obvious discrimination against paddy," says P V Balachandran, director of the Paddy Research Centre, Pattambi. "The production incentive for paddy remains at Rs 350 a ha while that for banana is 20 times higher, at Rs 7,500. Most often farmers don't even bother to avail of this pittance." Subsidies for cash crops like rubber and cardamom are far higher, Rs 20,000 a ha and Rs 40,000 a ha, respectively. According to the Rubber Board, the area under rubber cultivation is steadily increasing; the state added 35,180 ha to rubber plantations during 2005-2007. While cash crops have been one of the reasons for large-scale conversion of paddy fields, experts also blame the Green Revolution, introduced in the 1970s, for adversely affecting paddy cultivation in the state. "The indiscriminate use of fertilizers and pesticides during the Green Revolution polluted soil and wetlands in the state, and has turned them into wastelands," says Balachandran. Over 7,000 ha of paddy fields in Kuttanad region, once known as Kerala's granary, are now lying fallow. "If food is the need of the state, then why should we alone bear the burden of rice cultivation at the cost our survival?" asks Varghese Thoduparambil, a farmer from Thrissur district. "If the state wants us to feed it, it has a responsibility to share the cost and provide us economic and social security." Apart from inadequate incentives, paddy farmers point out that the prevailing procurement system only adds to their misery. The government had entrusted the responsibility of procurement of paddy to the Kerala State Civil Supplies Corporation, which in turn handed over that job to private rice mills. Some of the mills deliberately delay procurement, forcing farmers to sell their produce at prices much lower than the procurement price. "Sometimes we sell paddy even at Rs 5 or Rs 6 a kg against the support price of Rs 10," says Hariharan, a farmer from Sultan Battery, Wayanad district. This is happening when the price of rice in the open market is at around Rs 20. "The support price and procurement schemes are meant to save farmers from the exploitation by middlemen and private rice mill owners. But the nexus between private rice mill owners, politicians and the government in the state push farmers into debt-traps," says Fr Thommas Peeliyanickal, director of Kuttanadu Vikasana Samithy, an organization spearheading farmers' movements in Alapuzha district. Farmers have to wait for months to get the price of their produce. This leads to distress and frustration, and finally they end in suicides. Paddy farming needs to be made remunerative if farmers are to survive, asserts Peeliyanickal. Farmers' organizations in Kerala are demanding a single-window subsidy of Rs 20,000 a ha, along with a production bonus of Rs 5,000 and an insurance cover of Rs 25,000, support price of Rs 12 a kg for paddy and district-level centres for procurement. They also demand labour subsidy since paddy is a labour-intensive crop and has become very difficult to get farm hands as they move to construction work. "The government can easily pool sufficient funds if it wants to meet farmers' demands," says K N Harilal, a member of the State Planning Board. "About Rs 1313.6 crore is available for food production under various central and state schemes and also under the schemes for the local bodies," he says. This, however, needs a coordinated effort from all related departments such as that of agriculture, electricity, irrigation, water resources, and revenue. In 1997, a five-member expert committee appointed by the state government to enquire into the decreased paddy cultivation had cautioned that any reduction in the traditional paddy area will naturally lead to increasing food insecurity. The commission had then suggested to the government to implement programmes to increase productivity of rice and conserve paddy fields on a war footing. The committee also asked the government to review its support policies for paddy, and making subsidies and incentives beneficial to paddy farmers. Instead of taking action on these recommendations, the government directly or indirectly encouraged filling up the fields for infrastructural development. Even the new legislation permits the government to reclaim paddy fields for "public purpose". "Considering the fact that most of the wetlands in Kerala have been lost to development projects, this loophole might prove disastrous, especially when the government is promoting sezs, it parks and industrial estates to attract private investments," says R Sridhar, an agriculture expert with Thanal. The Kerala Nelkrishi Samrakshana Vedi, a collective of environmental groups and farmers' bodies from across the state, has submitted a memorandum to the government demanding a total moratorium on reclamation of wetlands even for public causes, at least until the state is able to meet its growing demand for rice. The revenue minister asserts that if at all paddy land is used for public purpose, it will be only under the scrutiny of a high-level expert committee. Meanwhile, the state agriculture department is enthusiastically moving ahead with its dream project Ellavarum Padathekku, literally, 'all of us to the paddy field'. 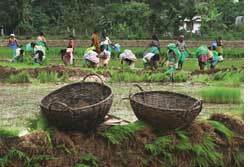 The Rs 100-crore project targets to double rice production within two years by expanding the crop area by 300,000 ha.